THC cartridges are one of the most funky and stealthy ways to get high on the go. The trend has been rapidly growing over the past year. As a result, the market is now saturated with plenty of brands to choose from. How is a consumer supposed to decide? Is there a way to know what you’re getting before you buy? 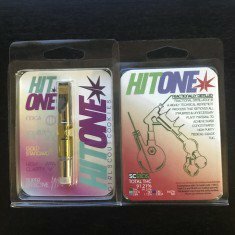 We only display high quality, 100% safe-for-use products on our website; and this 91.21% THC Triple Distilled Marijuana Oil Cartridge from Hi Tone is as pure-as-can-be. These indica oil cartridges are enormously trendy – a proof of its quality and safety. Unlike the Sativa Hi Tone Oil Cartridges, this indica will make you feel extremely relaxed and/or sedated. The indica properties of this cartridge makes it better suited to evening use just before bed, or after you might have cleared out your schedule, or on lazy days when there are no physical tasks to handle. THC levels are 91.21%, making this an extremely powerful product.